In Calvin’s day, Geneva was divided into three church districts, with each one having its own building: St. Pierre, St. Gervais, and St. Madeleine. Calvin preached at St. Pierre on Sundays, and elsewhere during the week. Each church had three services on Sunday: at sunrise, nine o’clock, and three o’clock. At noon a catechism class for children was taught. There were additional services throughout the week on Monday, Wednesday, and Friday, so there was no shortage of preaching for those desiring it in Calvin’s day. Calvin himself preached twice on Sunday, and in 1549 the city council determined that Geneva needed sermons Monday through Friday as well. Calvin wound up preaching an average of ten sermons every fourteen days, in a rotation with other ministers. Source: Herman J. Selderhuis, John Calvin: A Pilgrim’s Life (Downer’s Grove: InterVarsity Press, 2009), 111-112. 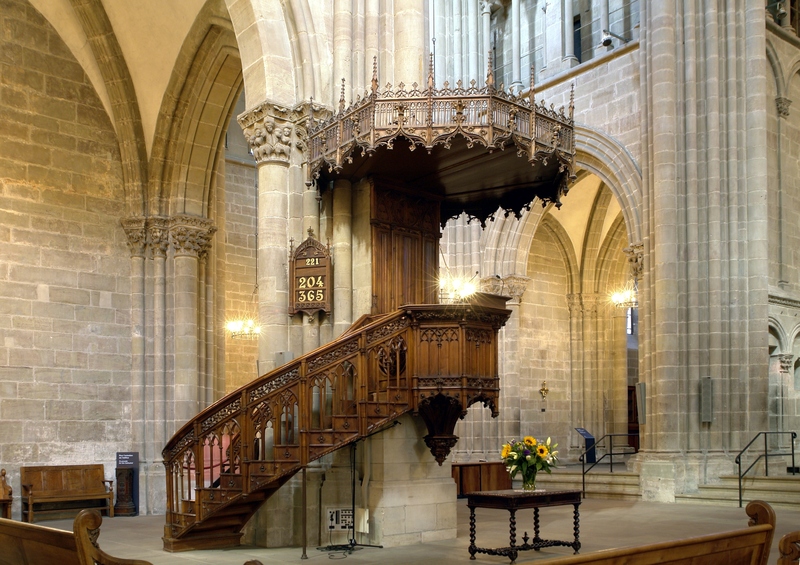 The above photo of the pulpit of St. Pierre Cathedral may be found online, along with others.